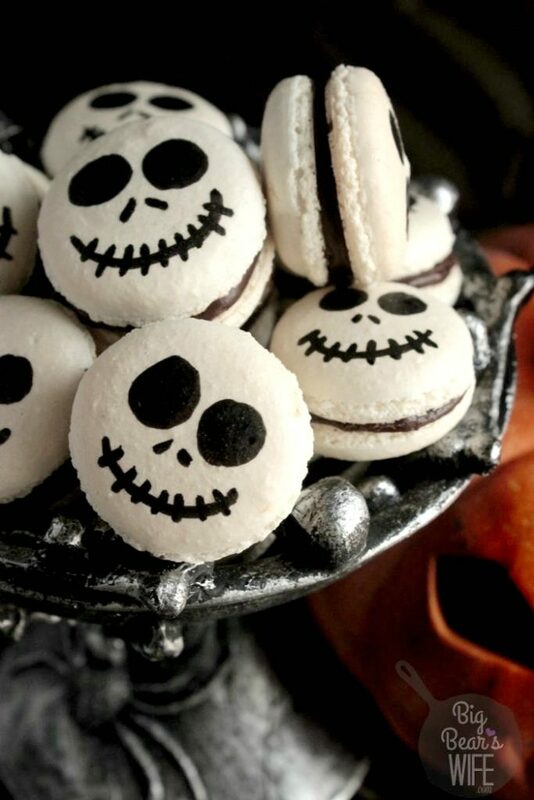 No need to be afraid of these Jack Skellington Macarons! 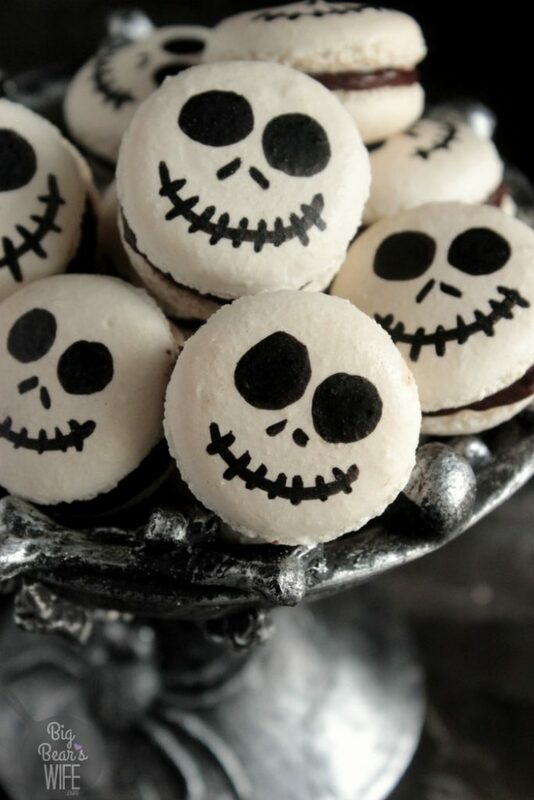 The pumpkin king might try to act creepy but there is nothing scary about these sweet little treats! Well this week has been all about Disney Halloween treats and crafts on BigBearsWife.com this week! Well, that’s mainly because Thomas and I are celebrating Halloween a little early this year down here at Disney World!! We spent 3 wonderful days down in Disney World but Hurricane Matthew drove us back up north. We were supposed to go to Mickey’s Not So Scary Halloween party last night but when were were supposed to be at the party we were half way home to Virginia trying to beat the storm. They cancelled the Halloween party at Disney and closed the parks today. We were supposed to be there until Saturday but with the Hurricane on it’s way, with sad hearts, we packed our bags and cut our trip short. So no Halloween Party this year, which broke my heart, but Thankfully we made it out of Orlando safe and sound! Today I was supposed to tell you how amazing our night was at the Halloween Party. I was supposed to be able to tell you how I met Jack and Sally in the Magic Kingdom and how we had the best time. I was supposed to be able to tell you about how amazing the parade was and how the Hocus Pocus show blew me away. But those things just didn’t get to happen. I am so grateful that we were able to make it make home safe with everyone that was evacuating but I still have to say that I’m pretty sad about it. You know how much it meant to me to be at Disney for our first Halloween celebration. However, I’m trying to keep my head up. I’m trying to just remind myself that we are safe and that’s what’s important. We can always try again next year. So, to mend my broken heart, I’m going to share something super special because I couldn’t have a Disney Halloween themed week on the blog without Jack Skellington!! Monday we started the week off with Mickey Pumpkin Marshmallow Cereal Treats. Wednesday I taught y’all how to make Halloween Mouse Ears with my DIY Ursula Mouse Ears Tutorial. 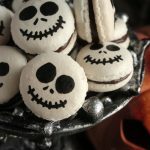 Today I’ve got Jack Skellington Macarons for you!! 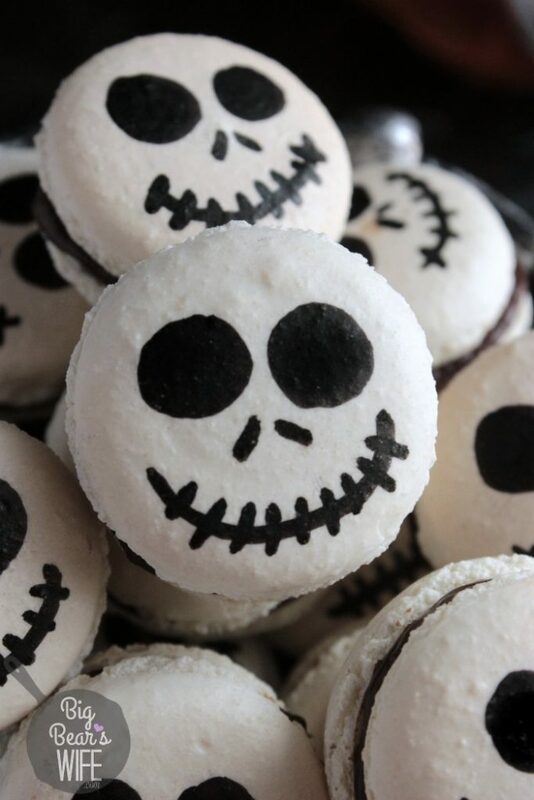 Thomas and I were sitting around the other night trying to think of something for me to make for the last “Disney Themed” treat for this week and I was scrolling through my Jack Skellington Oreos Pops when the idea hit me. I knew I had to make something with Jack but needed to make some type of round treat in order for that to work. After looking at my Oreo pops I thought of macarons! 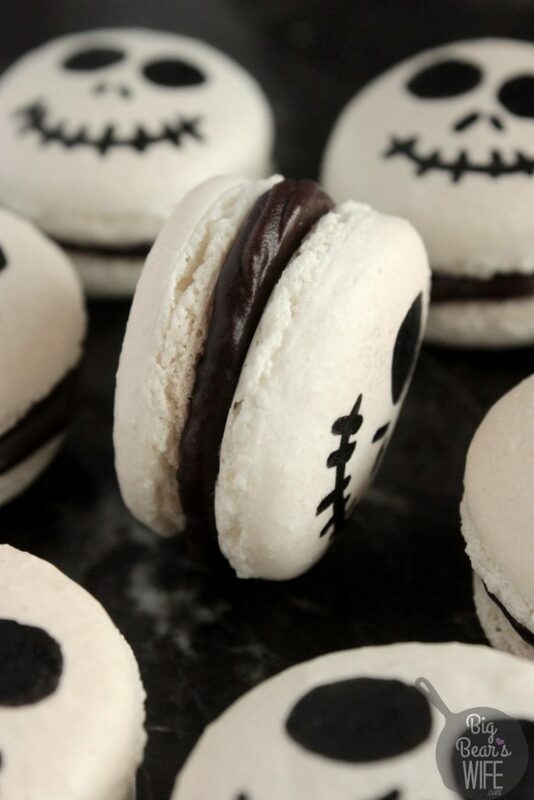 I love macarons and I knew that they would be perfect little Jack Skellington desserts! There was only one problem. I had never made macrons and I was scared. I had eaten quite a few macarons haha but I had never attempted them. I had heard horror stories about people making them at home. I had heard bakers say that it took years to master the art of macarons making and that one would need to practice over and over and over before they even got the first decent batch. I have literally been watching macaron making videos over and over for like the past year. I did. Oh I did and guess what! Macarons, while a tad bit picky, aren’t actually that hard to make. Let me tell you something, if you can make meringue cookies, you can make macarons! But oh my, the third time was a charm, so I’m going to tell you what I learned during the process. 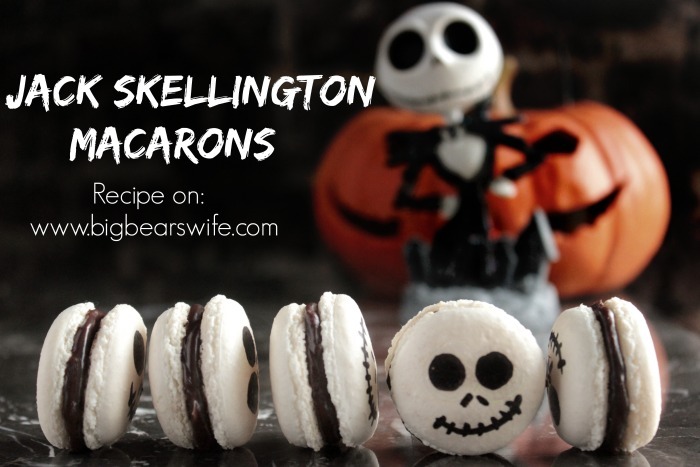 Let me start off with the recipe I used – well the recipe I used and changed up just a tad since I was making Jack macarons. I used the recipe that Carrie from Bakeaholic Mama used for her Pumpkin Pie Macarons… but you know… minus the orange and pumpkin haha. Almond meal and Almond flour are kind of different, well around here they are anyways. –When I first went to make these, I bought almond meal because almost all of the recipes I found called for it. I went home, ran it through the sifter/sieve like I was supposed to. It had little brown pieces in it from the almond skins (I guess you call it skin). Maybe that doesn’t normally matter but I wanted these Jack Macarons to be perfectly white, so those pieces of brown almond has to go. So my first batch of Jack Macarons were tasty but they had freckles haha. I have freckles, Jack does not. 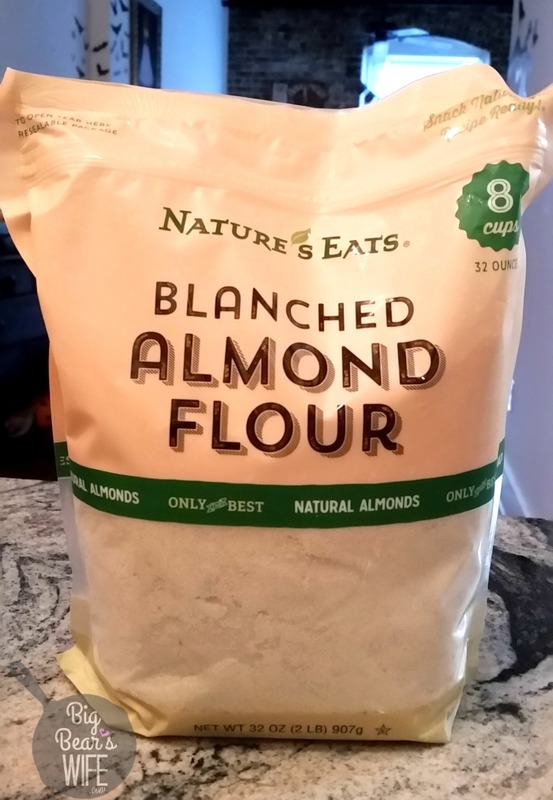 I found this almond flour at Walmart and it did much, much better! Also, my first batch of macarons was not as smooth as I wanted them to be. I wanted the smooth top for the macarons and my first batch, while tasty, was a little bumpy and grainy looking. That was not what I was going for. Also, even though I had used white food coloring, they weren’t super white but more like a dull whiteish color. womp womp. The second attempt was going well at first. I colored them just right, once I pipped them they had that super smooth top and I let them rest for an hour instead of 30 minutes before baking. I just knew that these were going to be winners. I popped them into the oven, put a wooden spoon into the door (Carrie’s suggestion), set my timer and waited. I was so sad. Those were supposed to be perfect. With a second macaron failure under my belt I set out for the third batch. Which turned out to be perfect. I used a lot more white food coloring and I folded the batter a bit more than before. My tip for the batter – fold the almond flour sugar mixture into the whipped egg whites, slowly. But keep folding. Keep folding until you can drizzle some of the batter with a spatula back into the bowl and it starts to “melt into” the batter in the bowl. You don’t want to over mix but you don’t want to under mix either. Make sure you let them rest for at least an hour before you bake them. Don’t rush them. Then for the faces! 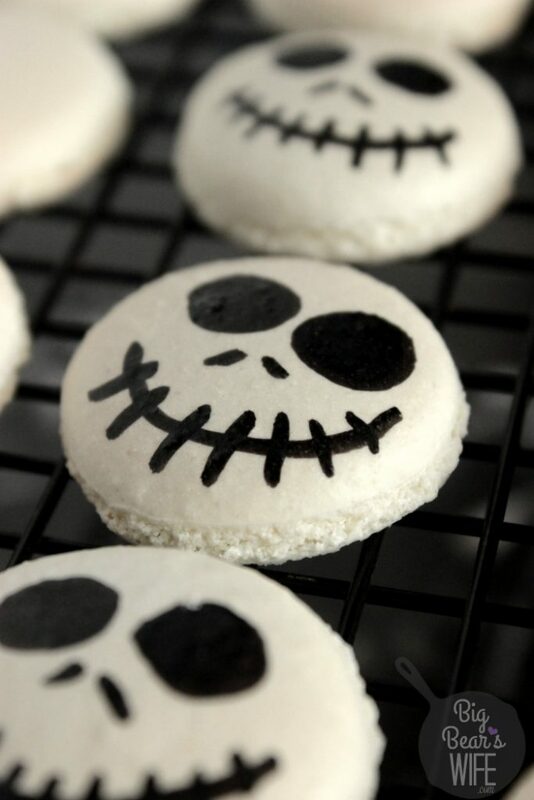 You can’t make Jack Skellington Macarons without Jack’s face! 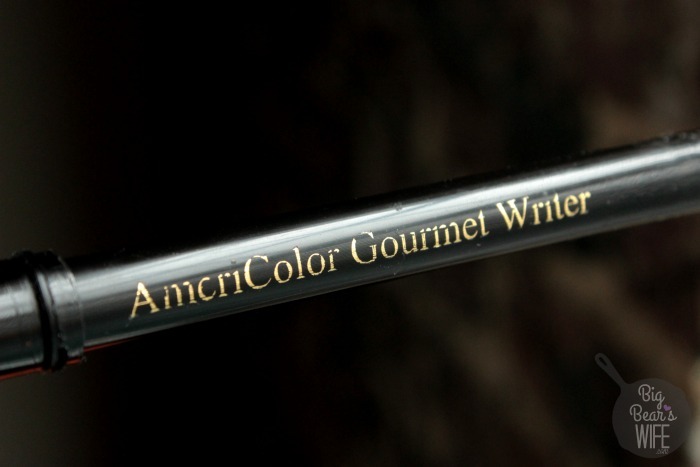 For Jack’s face I used one of these black, AmeriColor Gourmet Writer edible food coloring pens. I’ve used other edible pen markers before but these always seem to do the best. Make sure you let those macarons dry completely before you attempt to make these faces. I let mine sit overnight before I filled them or drew on the faces. BE GENTLE! You’ve GOT to use a light hand to draw these faces or you’re going to crack your Jacks! You barely need any pressure to write with these edible pens so be careful. Also, one last tip. I filled these with a homemade chocolate ganache but you can use any type of filling you want. However, I do say this….make sure the filling is soft! You don’t want to have to really push down really hard with these when you’re making them into a sandwich because they will crack. These macarons are wonderful but they’re delicate. Now go forth! 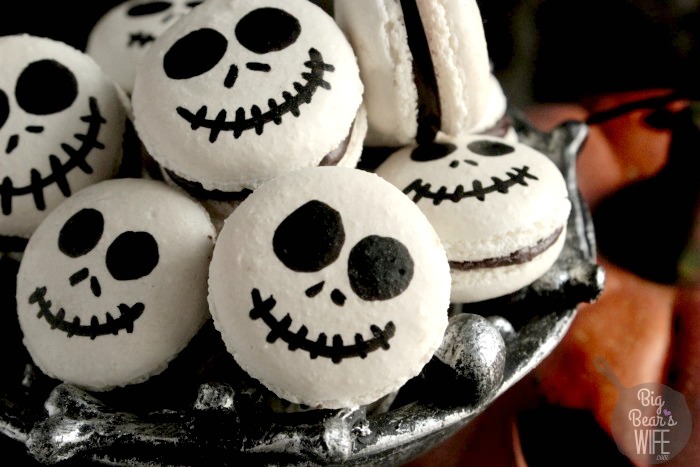 Make Jack Skellington Macarons and let’s celebrate Halloween!!!! Set a timer for 15 minutes and let the egg whites whip on high until stiff peaks form and the mixture becomes shiny. Whip in the white food coloring, add as little or as much as you like. Slowly fold and mix until everything is mixed well and becomes smooth. It will be super thick at first. You'll know it's ready when it's smooth and "melts" into itself when you drizzle some of the batter back onto it'self in the bowl. Bake the cookies in a preheated oven with the door slightly open. Bake cookies for about 12 minutes or until they\'re matte looking and dry to the touch. Watch them and don\'t let them burn! Remove from oven and allow the cookies to cool completely before filling with chocolate ganache filling. I let mine sit overnight before filling them. Draw Jack faces on half of the cookies. Pipe filling into the other half. Sandwich together to create Jack Macarons. And these macarons are so fun! You did an awesome job on them. You are so talented, Angie! These are amazing! My kids would love these! They turned out GREAT For your first try!! WOW! I love these so much! You have done it again with another super creative Halloween sweet! Thanks for all the macaron tips. I have never made them, but I do love to eat them. these will be the star this halloween! I love it. Those are so awesome!! You did a fabulous job and my kids would totally love these. 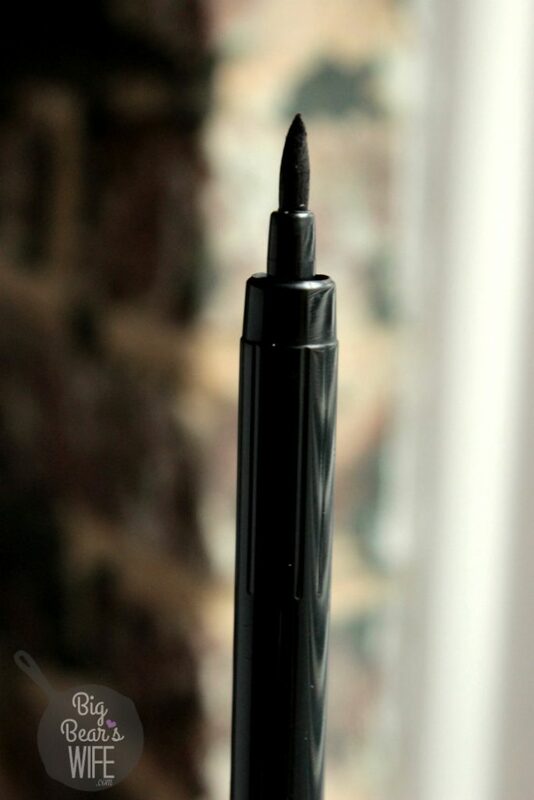 And I never knew there was such a thing as an edible marker, thanks for introducing me to it! I was so bummed to hear that you didn’t get to go to Mickey’s Halloween Party because of the hurricane. I am glad that you are safe though. I’m super impressed that you gave the macarons a third try–you were obviously on a mission. Just look at those perfect little “feet” on the bottoms! Oh, Jack’s cute too! These are so cute and creative!! Who knew there was such a thing as an edible marker??! I’m sorry you missed your party, but I’m very glad you are OK! 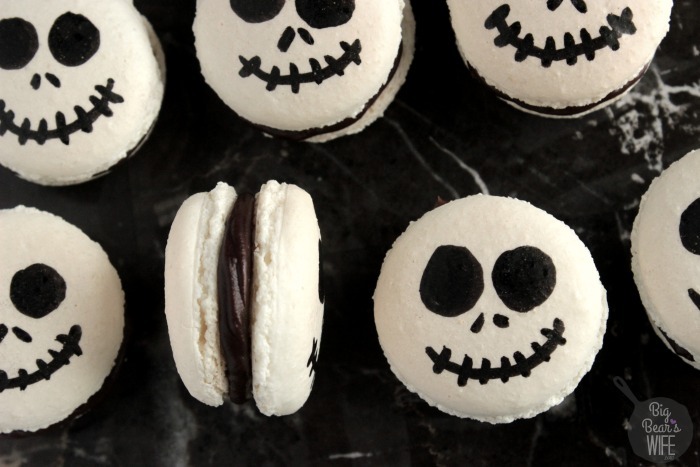 These are just the coolest macarons ever. For real. I’m so glad you made it home safe and sound. I love macarons but I’ve never seen them presented this creatively! What a great Halloween dessert! LOVE! LOVE! LOVE! These are the BEST idea for Halloween! Just pinned to my Disney board! Your macarons are amazing. They are the best! They are perfect for Halloween! I’ m so sorry you had to cut your trip short! That’s so sad – especially because it was Disney. I’m glad you had a great time while you were there. I always love your Halloween treats each year and these are no exception! What a creative idea for Halloween party! I’ve never made macarons, but have wanted to for a long time. Yours turned out so great! Sorry about your trip to Disney being cut short. I know how much you love Halloween. These cookies are fantastic. Well done! So sorry your trip got cut short and you missed the Halloween party! 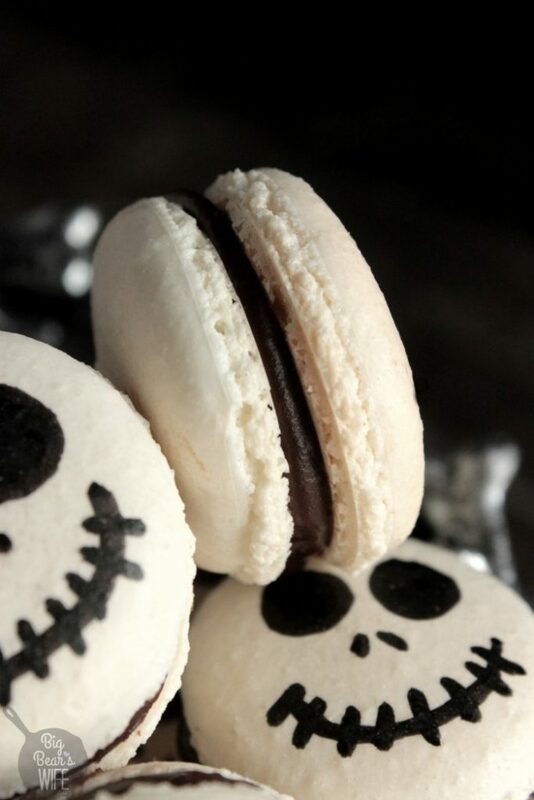 Those macarons are absolutely perfect and definitely the coolest Halloween treat I’ve seen this year!! So glad you made it out of Orlando safely….you are so creative! These are adorable!! Definitely on my “to do” list!! When do you add the white food coloring? Thanks, I’m not sure why it switched it after I published it. ALLLL the good details! Macarons have always freaked me out a little because I know they can be so delicate and fussy but these are great tips! Also – Suuuuper adorable. Hi there, I just tried these and as far as I’m concerned I used the listed measurements but my batter ended up way too dry and sticky, no matter how long I folded it. I could barely pull my spatula out of the batter and it certainly didn’t drip from my spoon (probably would have stuck to the spoon even if I threw it across the room). Do you have any idea what I could have done wrong? These are adorable and I’d love to make them for a Halloween party!